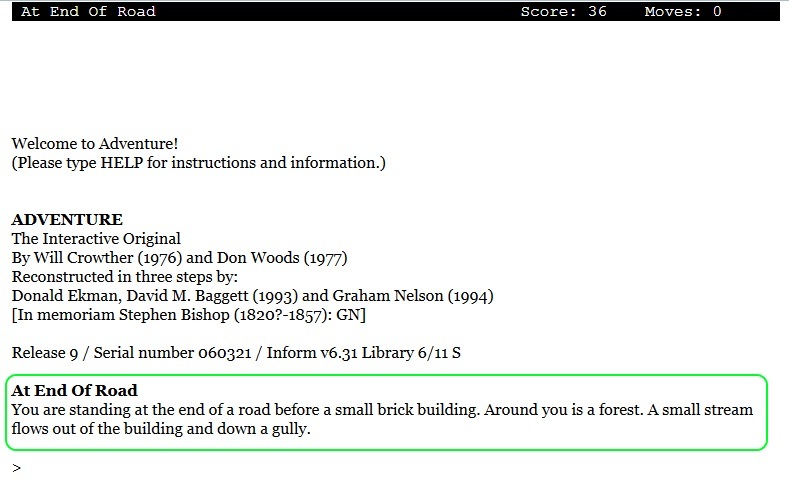 This is the first in a series of quick-start Inform 7 tutorials using examples from Colossal Cave Adventure. More information about this tutorial series can be found here: A Quick-Start Guide to Inform 7. 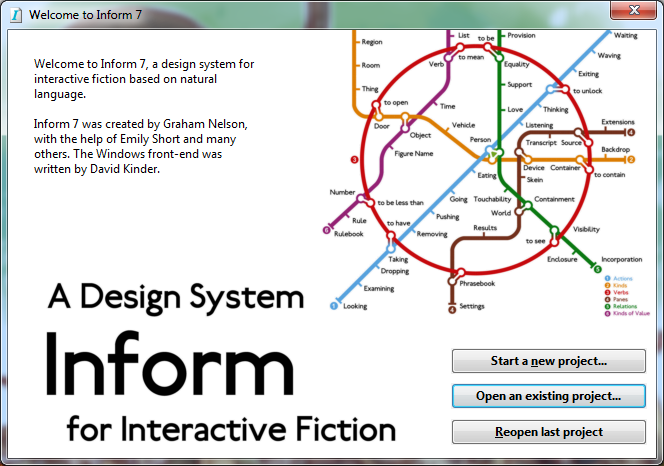 Inform 7 is available for Mac OS, Windows, and Linux from the official Inform 7 website. I am personally running the Windows version, so my screenshots will be for Windows. Download, install, and run Inform 7. Choose “new project” and fill out the title and author fields. 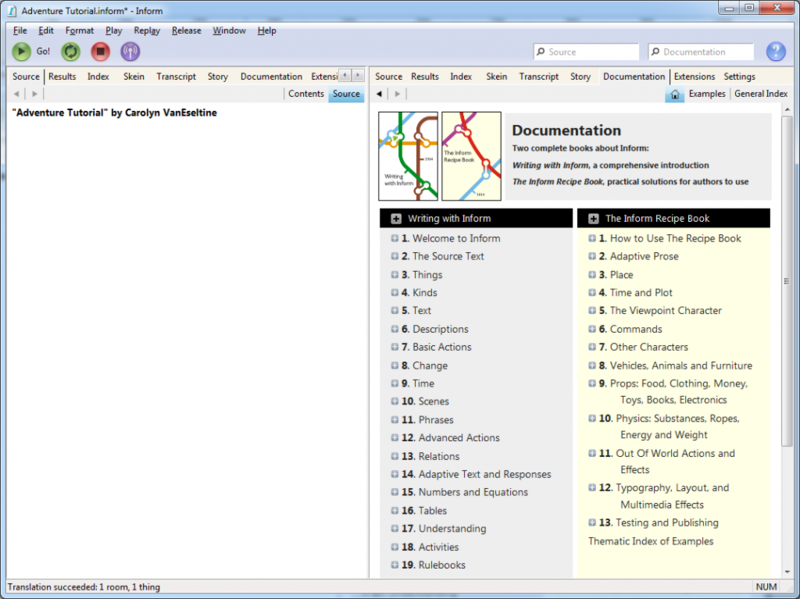 The IDE has two windows and a number of tabs for each window, including Source, Results, Index, Skein, Transcript, Story, Documentation, Extensions, and Settings. Since this is a quick-start guide, we are going to ignore the vast majority of them, but the Documentation section contains all the in-depth Inform 7 information that this guide does not, and should be considered the primary resource for further investigation. Rooms are the most basic element of an Inform 7 game. This is the first screen of Adventure. The part enclosed in green is the room, divided into the room name (in bold) and the description (below it). Enter this code and then click the “Go!” button. This will compile and produce a one-room game, as shown below. You can create as many rooms as you want this way, but you won’t have any way to get between rooms unless you connect them together. Rooms are connected either with doors or with compass directions. From At End Of Road, you can go north to In Forest, south to In A Valley, west to At Hill In Road or east to Inside Building. A room called In Forest is north of At End Of Road. A room called In A Valley is south of At End Of Road. A room called At Hill In Road is west of At End Of Road. A room called Inside Building is east of At End Of Road. Press Go! and try this out. Note that Inform will automatically set up the reverse direction as well – once you go west, you can then backtrack to the east. 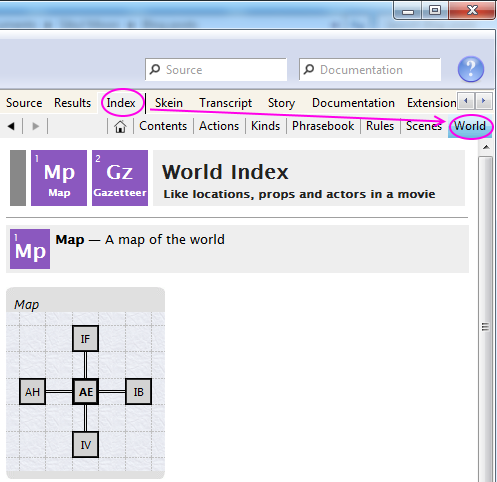 In the IDE, there is a link marked “Index.” Click on Index, then click on World. This will allow you to preview your work by looking at an automatically generated map of the rooms you have made and their connections. Sometimes, you will want to create more than one directional connection. This is the case in Adventure, where you can also get to In A Valley by going down, At Hill In Road by going up, and Inside Building by going inside. A room called In A Valley is south of At End Of Road. A room called In A Valley is down of At End Of Road. A room called At Hill In Road is west of At End Of Road. A room called At Hill In Road is up of At End Of Road. A room called Inside Building is east of At End Of Road. A room called Inside Building is inside of At End Of Road. Non-compass directions such as up, down, in, and out will show up on the world map as indicative squiggles. Mousing over the squiggles will show you the connection details. 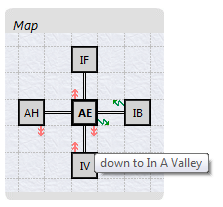 In Adventure, map connections are not entirely reliable. Going north to get somewhere does not mean you can go south to get back. There is a room called In West Side Chamber. A room called N/S And E/W Crossover is up from In West Side Chamber. Down from N/S And E/W Crossover is nowhere. Your Living Room is a room. Your Kitchen is east of Your Living Room. In Forest is a room. There is a room called In Forest. In this lesson, as in future lessons, I have preferred to use more reliable syntax over less reliable syntax. I wouldn’t recommend using more than one “A room called” statement for each room. I think it would be better to change those, and you could introduce the concept of creating an object vs assigning properties then too. Ideally, I wouldn’t recommend using the “a room called” syntax at all! Turned out to be a quirk of using the original Adventure room names. If they hadn’t broken the I7 compiler, I would have used the normal syntax. But given the choice between “use this syntax, except over here and here where it breaks, and then use a different syntax” or “this syntax will work everywhere, use it”, I opted for the faster version. By your reference to “creating an object vs assigning properties”, are you picturing setting up the rooms with printed name properties, or something else? Someone could easily think that it is actually creating two rooms with the same name. Maybe this is more of a problem if you’ve been using I7 for a while. No good options really. Why is one down of and the other down from? A lot of the problems are coming from the prepositions in the names right? At some point, I probably do need to address how to make more than one room with the same name. (Twisty little passages all alike!) I’m going to push it to later though. Because I didn’t even notice I’d done that. Whoops! Adjusting. Need to reach me? Email carolyn at sibylmoon.com.